Why didn’t the chicken skeleton cross the road? This entry was posted in Gallery and tagged animals, BIRD, Cedar Waxwing, chilling, d810, fact, fun, joke, lyndhurst nj, Nature, Nikon, NJ, Photo, Photography, sitting, sky, Tamron, The Mask Of Waxwing, tree, Waxwing, wildbird, Wildlife, winter. Bookmark the permalink. Would you share what lens you used to capture this…I love this! I love Cedar Waxwings! Whenever I see them I can never remember the name and I have to go and look it up. Wonderful picture! Such sweet birds to watch! Great shot & I love the interesting facts. Thanks. I have seen cedar waxwings only one time. I didn’t know what they were; had to look it up. 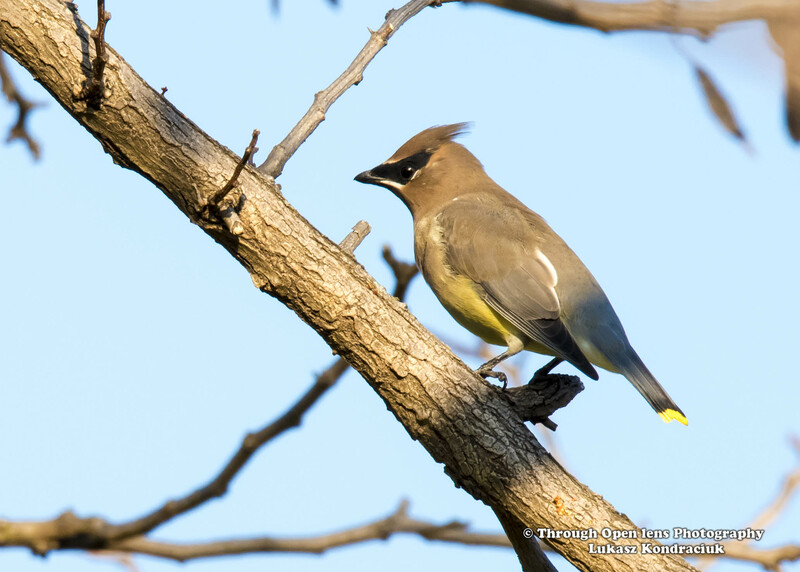 We see flocks of Cedar Waxwings mostly during the Fall migration south. They perch in the tops of the trees, which by then are bare, overnight. As the sun first begins to shine and warm them up, they go to eating the fruit on the dogwood and blackgum trees. By mid-morning, they are off to the next destination in the forest.